Matroosbergstasie is a de-commissioned railway station situated in the Klein Karoo just off the N1. We were invited to stay over for the night after an adventurous mountain bike ride all the way from the Moreson Farm Stall through the old historical railway tunnels. As soon as we arrived, we knew we were in for something special! Graham and Sally Abrahams welcomed us with a cold beer at the converted maintenance shed now called the “Red Bar”. We felt like old friends from the start and talked about all the adventure experience opportunities at this amazing location in the Klein Karoo. Its truly an off-the-grid experience from the get go, stress-free and good vibes! Graham gave us an insightful historical tour on all the converted & restored original heritage buildings and their previous functions at the time of the operating railway station. 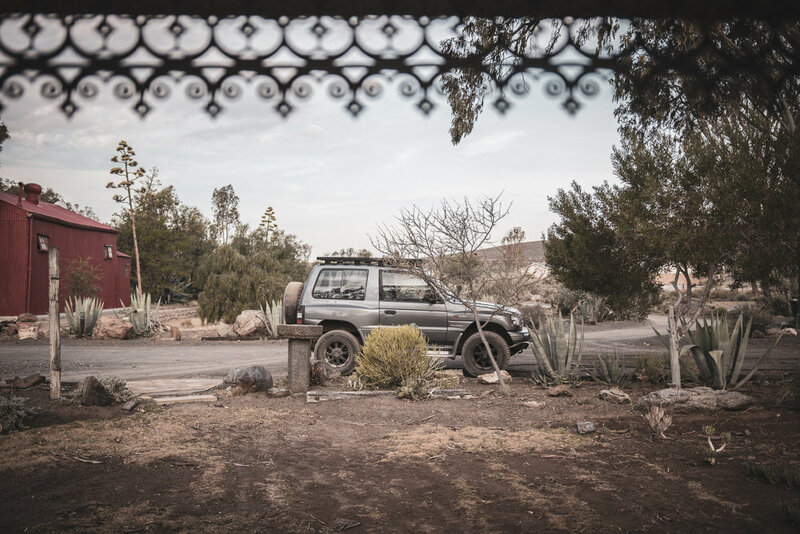 The renovated buildings now serve as a conference centre, restaurant, classy bar and a custom Yamaha fitted 100-seater “Opistasie” Theatre in the middle of the Karoo. It’s the perfect stop for a corporate retreat, family holiday or for the adventurous mountain biker keen to explore in a different way. There is also a pool to cool off on those insanely hot summer days and a massive braai for special events to accommodate big groups of people. There is also a soon-to-be-ready “Opistasie School” that will offer bespoke activities for Team Building, School outings and Adventure Boot Camp with facilities and accommodation for up to 44 people! Here is the Airbnb booking link for the Pophuis. Graham also took us to the historical site of the ‘cutting’, just a few minutes walk from the main house. This is the largest manual (hand-dug) railway line cutting excavation in the world! We took the drone out and were amazed at the distance and hard labour that went into the digging of the cutting more than a hundred years ago! We ended the evening with braai feast with friends of Graham and Sally. It was a such an experience and joy to listen to all the stories, historical facts and range of activities this place has to offer. It was hard to leave the next day but we will surely be back soon, to plan a once-in-a-lifetime adventure experience for our guests. So watch this space and keep an eye out on The Secret Adventurer event announcements later this year, it’s going to be awesome! Team TSA, Henk & Andre.